the location was great, and the installations were also really good. Nice room with nice view. SPA. Good Wifi. Was lucky to find free space on car park close to the entrance. Quiet and close to the beach. The pillow was small and flat but got another one on request. Perfect location, spa area, breakfast, hotel area & staff. Fantastic swimming pool. Great breakfast. Extremely friendly staff. Large, modern, quality hotel. Short walk to beach, promenade and station. Excellent, massive pool with top quality sauna area and jacuzzis. Very well equipped gym (not the usual few machines in a broom cupboard). All free of charge and all open all day. Modern, airy room/suite with fridge, freezer, kettle, cutlery and plates/cups/glasses - even a corkscrew. large balcony. Comfortable double bed (not the usual two singles pushed together) with proper pillows. Mixed age clientele at weekend, but during the week mainly over 80s (think they offer tailored wellness packages). Superb cold buffets at both breakfast and dinner. (They also have hot buffets but not of the same quality). Really comfy bed. Nice swinning pool and relax zone. Service, Freundlichkeit und Reinigung waren sehr gut. Hotel Diva SPA This rating is a reflection of how the property compares to the industry standard when it comes to price, facilities and services available. It's based on a self-evaluation by the property. Use this rating to help choose your stay! One of our top picks in Kołobrzeg.Located in a quiet seaside park in Kołobrzeg, 2 minutes walk from the beach, 4 star Hotel Diva Spa offers rooms with free Internet access. Guests have unlimited free access to an indoor swimming pool, a hot tub, a sauna and a salt cave. The elegantly appointed rooms at the Diva Spa come with free Internet access and a safety deposit box. All feature satellite TV and a shower cabin in the bathroom. Beach screens and loungers can be rented. Most rooms feature a balcony. During their stay at the Diva, guests visit hotel restaurants, Bella Donna and Riccardo, well as Figiel cafe. In evening, the Q Club is perfect place to be. Hotel Diva Spa located in picturesque, green part of Kołobrzeg, about 0.6 mi from Kołobrzeg Railway Station. Kołobrzeg Lighthouse is 1.2 mi away from the hotel. 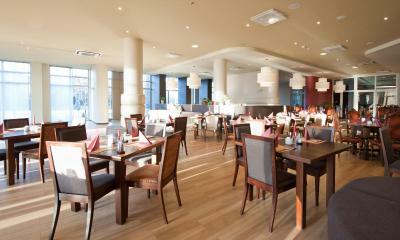 This is our guests' favorite part of Kołobrzeg, according to independent reviews. When would you like to stay at Hotel Diva SPA? Spacious room with a balcony and a flat-screen TV. Please note that an extra bed cannot be added in this room type. More luxurious and more spacious rooms. Guests have spa towels, tea, coffee and sugar at their disposal. One extra bed is available in this room type. Please contact the property prior to arrival to arrange this. This spacious and modern room features two beds which can be joined. Guests have spa towels, tea, coffee and sugar at their disposal. Up to two extra beds are available in this room type. This spacious apartment consists of bedroom with two beds (can be joined) and a living room with kitchenette and fold out sofa bed. Guests have spa towels, tea, coffee and sugar at their disposal. Up to 3 extra beds are available in this room type. Please contact the property prior to arrival to arrange this for you. House Rules Hotel Diva SPA takes special requests – add in the next step! Any additional older children or adults are charged PLN 150 per night for extra beds. Hotel Diva SPA accepts these cards and reserves the right to temporarily hold an amount prior to arrival. Please note there is a limited number of free parking places outside the hotel. Staff was not very friendly. Bed not comfortable, breakfast not great. Many things are available in this hotel, but many of them are missing the finishing touch. Sometimes not working or poor internet connection (Wifi) Cold Water, broken shower hose that I called to repair and they never fixed it. Broken Sofa, water leaking cieling. Great receptionists and great food. I asked for a queen-size bed and I got two single beds stuck together. I paid more so I could get a queen-size bed because the lower price said it wasn't available and then I still didn't get it so I could have got the lower-priced room instead but that's not what I wanted it was supposed to be a special romantic weekend and I didn't even get to sleep with my fiance. I liked the pool and the salt cave. Facilities Opening Hours - after 10.00pm everything get closed. As we arrived late was forced to order pizza delivery. The heating was not sufficient enough and room was just cold. Worn Pillows, chiped plates, worn out bikes.